When I was a newspaperman, we often joked that the scariest words in journalism were “first in a series.” Just let readers see that and they’d run screaming from the breakfast table. So, consider yourself warned. I’m planning a succession of articles on budget cigars. Well, not exactly budget cigars. More like really cheap cigars. None over $3 (and only one at that lofty price tag, and that’s just because I thought it looked interesting). 1. Don Gregory Extreme. $3. It is said to be Dominican filler with a Cameroon wrapper and looks like an imitation Hemingway Short Story. Purchased at an outlet shop not far from my house. 2. Cuban Rejects. $1.35. This is a six inch stick that looks to be about 48 ring gauge. One Internet source listed them as Dominican, another called them a Nicaraguan handmade sandwich cigar. They may be made and/or imported by Phillips & King; it’s not easy to tell. 3. Havana Blend Maduro. $2. These come from Texas’ Finck Tobacco Co., which says they include Cuban filler from the “vintage crop of 1959” imported before the embargo and mixed with Central American fillers inside a Connecticut Broadleaf wrapper. Mine is a five inch by 43 ring gauge Coronado. 4. Alcazar No. 4 Maduro. $2.75. According to AtlanticCigar.com, which sells these in bundles, they are “100% Long Filler” with Nicaraguan binder and filler and a Connecticut wrapper. The No. 4 is listed as a five inch stick with a 52 ring gauge. So, let me begin with that Dutchie. Why did I choose it among the seemingly endless array of machine-made sticks? Partly, I suppose, due to fond memories of Ernie Kovacs and the ads on his show when he’d pose as one of Rembrandt’s “masters.” I also figured that with an actual tobacco wrapper it might be a better smoke than most. But, my god, if it is better, then the others should be registered with U.N. weapons inspectors. To begin with, I couldn’t decide whether the packaging is intended to protect the cigars or protect you from the cigars. The box is sealed in cellophane. Then the four sticks are enclosed in a sealed cellophane “pouch.” Finally, each Corona De Luxe is individually cello’d as well. So after going through enough clear plastic to shrink wrap the Hollywood Bowl, I got to the cigars. Despite all the packaging, the foot was somewhat smushed on all four. The first one I pulled out had veins that looked like scars left behind by a hurried battlefield surgeon in the Crimean War. There’s also the typical machine made hole-in-the-head (and, yes, you’re right; it’s an apt metaphor for trying one in the first place). Even before lighting, I noticed an odd sweet taste that I couldn’t identify. It nearly matched the cigar’s smell – and believe me these smell; it’s not an aroma. After lighting and a few puffs, I was able to identify it. Bubble gum. But not just any bubble gum. If you remember the sticks packed with Topps baseball cards – brittle and stale by summer’s end – then you’ve got it. I thought initially that the cigar was no worse than any number of really lousy cigars I’ve smoked through the years. Distasteful but not distinctively so. After just a bit more smoking, the Dutchie had turned into the foulest, harshest thing I’ve ever smoked. The good news is that it didn’t make me sick – though I guess it might have if I’d smoked more. The finish was akin to breathing in smoke from a campfire of sap-filled, uncured pine logs. Multiple tooth brushing, tongue scraping, and mouthwash swishing didn’t do much. I tried smoking a good cigar about an hour later, foolishly thinking it would obliterate the memory. All that happened, though, was that the new smoke was ruined. In fact, I’ve stopped smoking for a couple of days hoping that’s long enough for my system to purge itself. I’m planning to try again this evening with another good stick. I’ve got my fingers crossed. It may be awhile before I try the next of these bargain beauties. After all, I’m not as young – or strong – as I once was. Which would you suggest I tackle next? Very funny description of the "Dutchie" experience. Better you than me. About a year ago I smoke about 1/4 of a horrible cigar and thinking I could "recover" with a good cigar turned out to be a waste of time. That first cigar left my mouth tasting so foul that I could not taste the good cigar. It took a few days before I even wanted another cigar. I, too, want to congratulate you on this article. It's a very interesting subject, and your descriptions and metaphors are wildly entertaining. Despite the warning in your lead, I'm very much looking forward to the second part of this "series." I have only smoked a couple of cigars in my life… the next time a male friend, such as my coworker who has been known to get cigar tips from his father, offers me a cigar, the first four words out of my mouth will be: "Is it a Dutchie?" Gotta say, I feel a strange affection for cheap cigars. Like cheap beer, they certainly worked when I was younger…and in the long run, turned me on to better, higher quality smokes (you know, the ones without the non-tobacco ingredients). That said, nothing clears a room faster than a Phillie Titan. Ugh. 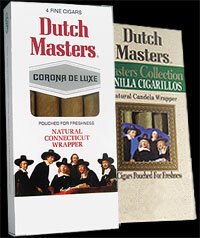 When I first started out I tried the Dutch Masters and the Candela wrapper as well. After a few puffs I thought about buying a pack of cigarettes… Both ideas terrible. Luckily I waited out the storm and now I won't even go near either one. I was in celebration mode last night and had the pleasure of smoking a Rocky Patel Old World Reserve. Near perfect smoking experience! 5 stogies! I love to hear about this one : Havana Blend Maduro. $2 … include Cuban filler from the “vintage crop of 1959” imported before the embargo. This is taking cheap smokes a bit far isn't it. The list just looks pretty nasty. This looks more like Penance. Aren't the JR imitation stuff around $2? Some of them aren't too bad. In either case, George, you're taking one for the team! I AM Don Gregory. Problems happen when CHEAP people buy SALE cigars and EXPECT First Quality. If you want a $6 cigar buy it…don't pay $2 & expect Dunhill. It was stated that we just "Whipped these up" because of the Small pieces of cameroon wrapper available to us. I've been in the Cigar business for 13 years..unlike your site that's only been up for 1 year. It is unfortunate you where too cheap (or ruthless?) to buy the FIRST Quality cigars like most. There is a reason why we export most of out PREMIEROS outside of Florida. As always stated by ME or parttime staff: "These are HANDROLLED items and like Blue Berry muffins, are prone to a once in a while variance. If there is ever a problem, come back for a full credit or exchange." Sad…there are plenty of well-cared-for/Quality cigars out there. But 1 Ruthless Penny Pincher & a Unemployed writer and the whole concept gets a bad name. hahaha great article. you had me laughing all the way through. I smoked my first Cuban Reject this evening, and I found it very pleasant. In comparison to a few I've been guided toward this week, I do believe that this was one of the most enjoyable. No band, no fancy box, and no real idea of where it was made or with what. All I could tell from my local cigar shop was it was rejected from cuba… whatever that means. Years ago I married a girl from Amsterdam Holland I was in the AF at the time stationed in Germany. I bought a box of Dutchmaster cigars for her father. He took a couple of puffs and threw the cigar out and gave the rest of the box to the garbage man. He took a puff and threw the whole box in the garbage and was on his way. The most terrible cigar I ever smoked. Now I'm on the cheap cigar (Cuban rejects) and loving it.. They are a good cigar for the price.